First Listen: Freelance Whales, 'Diluvia' Diluvia's songs practically glow with multi-part vocal harmonies, banjos, strings, horns and other mad manmade clatter. Even the synthesizers sound warm, loose and light. 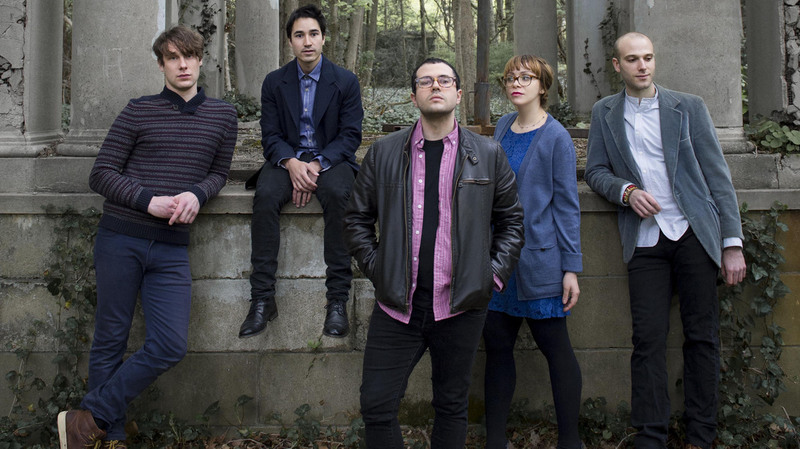 Freelance Whales' new album, Diluvia, comes out Oct. 9. Freelance Whales' first gigs took place on New York City streets and subway platforms, and the quintet's music has never strayed far from its organic origins: The songs practically glow with multi-part vocal harmonies, banjos, strings, horns and other mad manmade clatter. On Freelance Whales' new album Diluvia, out Oct. 9, even the synthesizers sound warm, loose and light. It helps enormously that Freelance Whales' approach feels rooted in a kind of game, show-choir playfulness; listen to "Land Features" from the new album, and you'll hear a band devoid of self-seriousness or posturing. For all its lofty conceptual angles — it's ostensibly about space exploration, ancient astronauts and whatnot — Diluvia conveys utter indifference to sounding cool or clever, opting instead to whir along happily in the pursuit of something pretty. For some, Freelance Whales may red-line the Cute-O-Meter — witness "Spitting Image," in which lead vocals are turned over to Doris Cellar, who coos sweetly over waves of synths and a chorus of "hoo! hoo! hoo!" — but there are far worse finds than a band that pours on such unselfconscious charm. Diluvia is the opposite of effortless: Its songs sound worked-over and impeccable, yet ultimately land in a place of unfettered joy.